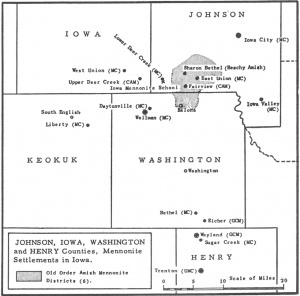 Mennonite settlements in Johnson, Iowa, Washington and Henry Counties, Iowa. Mennonite Encyclopedia, v. 3, p. 116. Note: East Union and Fairview have accidentally been reversed in this map. Johnson County, Iowa, in the eastern part of the state, lies approximately 50-70 miles (85-115 km) west of Davenport. It is an agricultural county with only one large city, Iowa City, within its borders. Located within the county in 1957 were six Mennonite churches; East Union, Lower Deer Creek, Iowa Valley, and Iowa City were members of the Iowa-Nebraska (Mennonite Church) Conference, while Fairview was Conservative Amish Mennonite and Sharon-Bethel was Beachy Amish. All but Iowa City and Iowa Valley were located in the southwest corner of the county. In the same general area were six Old Order Amish districts with 464 members, most of whom lived in Johnson County. The Johnson-Iowa-Washington county settlement contained 2,821 Amish and Mennonite church members in 16 congregations of whom approximately 1,800 lived in Johnson County. Of the 2,821 members, 1,835 belonged to the Mennonite Church (MC), 470 to the Conservative Amish Mennonite Conference, 52 to the Beachy Amish, and 464 to the Old Order Amish. The first Amish to move into the county came from Ohio and Pennsylvania in 1846. The settlement was one of the most successful established by the Amish in the central states and has grown steadily during the past century. As the home of three generations of Swartzendruber bishops—Jacob, Frederick, and Jacob F.—as well as of Samuel D. Guengerich and his publishing enterprise, the community has been unusually influential in Amish Mennonite circles. In 1945 the Iowa Mennonite School was established in the heart of the Johnson County Mennonite community. Unusual also is the fact that from this Amish community have come at least nine Mennonites who have earned the doctor of philosophy degree. At least 12 Elkhart Institute and Goshen College faculty members were born in this settlement. Swartzendruber, E. G. Amish and Mennonite Church Centennial near Wellman and Kalona, Iowa. Wellman, IA, 1953. Gingerich, Melvin. "Johnson County (Iowa, USA)." Global Anabaptist Mennonite Encyclopedia Online. 1957. Web. 19 Apr 2019. http://gameo.org/index.php?title=Johnson_County_(Iowa,_USA)&oldid=113445. Gingerich, Melvin. (1957). Johnson County (Iowa, USA). Global Anabaptist Mennonite Encyclopedia Online. Retrieved 19 April 2019, from http://gameo.org/index.php?title=Johnson_County_(Iowa,_USA)&oldid=113445. Adapted by permission of Herald Press, Harrisonburg, Virginia, from Mennonite Encyclopedia, Vol. 3, p. 117; vol. 4, p. 1146. All rights reserved. This page was last modified on 20 February 2014, at 03:31.